What Are the Benefits of Seaweed Soup? The ocean contains every mineral needed for good health. Plants such as seaweed absorb these minerals from the sea; they are then turned into a bio-available form during photosynthesis. Coastal Asian countries such as Korea and Japan have relied on seaweed as a diet staple for centuries. Western countries are beginning to recognize the nutritious benefits of adding seaweed to the diet. Seaweed soup is a nutrient-dense meal that can be made hot or cold for health support throughout the year. Check the source of seaweed before purchase to ensure it came from un-polluted waters, as sea plants can absorb toxins. In Korea, women who have given birth are fed a seaweed soup called "miyeok" one or more times each day for a minimum of two weeks following delivery, according to a paper on Korean cultural beliefs published by the University of Hawaii's Community College. 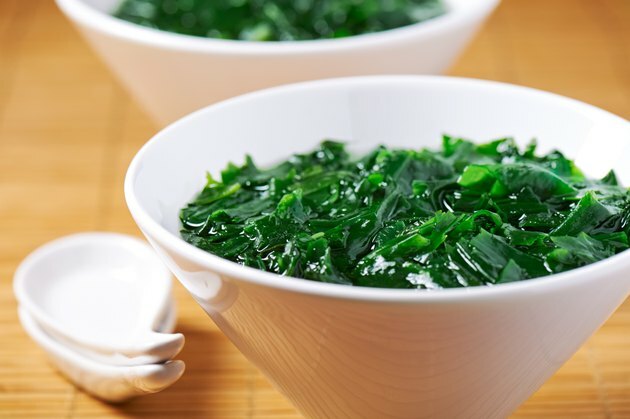 The sea vegetable wakame is the preferred type of seaweed for this soup, which is believed to re-supply the mother's body with minerals and vitamins lost during pregnancy and the birthing process, although this claim is not backed by peer-reviewed studies. Imagine something as simple as one bowl of seaweed soup each day helping your body resist allergens. Research is suggesting this idea might have credence. According to a study by the Department of Public Health at Fukuoka University School of Medicine in Japan, published in the August 2006 issue of "Annals of Epidemiology," high dietary intake of seaweed may correlate with a reduction in allergic rhinitis. Exciting advances in cancer are happening and one is related to a plant ingredient found in seaweed, known as fucoidan. This polysaccharide has a chemical structure which is close to the drug heparin. According to laboratory research presented at the AACR Dead Sea International Conference on Advances in Cancer Research in March 2010, seaweed may become a treatment for lymphoma in the future, due to preliminary findings which show anti-tumor activity in lab animals. The National Center for Complementary and Alternative Medicine recommends telling your health care providers about any complementary and alternative practices you use. If the 3.2 percent obesity rates in Japan and Korea are any indication of diets high in seaweed preventing excess weight gain, compared to 30.6 percent in the U.S., then seaweed soup may have fat-preventing capabilities. According to a report from Science Daily, preliminary research at Newcastle University in Newcastle upon Tyne, England is showing that alginate, a natural fiber found in sea kelp, a type of seaweed, stops the body from absorbing fat. Lead scientist Dr. Ian Brownlee explains that the initial findings indicate that alginates have a considerable ability to lower fat digestion.